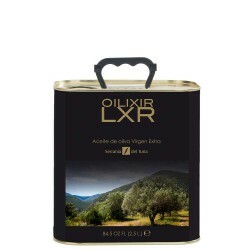 Olive Oil Can 2 L. Finca la Torre Ecologic Arbequina. It is a cold extraction oil stored in stainless steel tanks and maintained in the best conditions until it is bottled, only and exclusively on request, to prevent its oxidation and thus arrive in the best conditions to our customers. It is an authentic extra virgin of the highest quality. It has a fruity medium to freshly cut grass and apple, with a sweet entry in mouth and certainly spicy given the characteristics of Arbequina. Ideal for mild tastes and those who value the sweetness and non-bitterness of oils. It is balanced, complex and very fluid. A splash in a tomato salad, a toast or in your fruit desserts will turn into special dishes whose aroma and flavor melt in your palate producing a festival of sensations. Do not wait any longer and give it a try!! !